Unbeaten WBO #1 heavyweight Alexander Dimitrenko (28-0, 18 KOs) continues on the road to his long awaited world title shot when he faces 37-year-old long time contender Luan Krasniqi (30-3-1, 14 KOs) on Saturday night at the Burg-Wächter Castello in Düsseldorf. The "Universum Champions Night" will also feature unbeaten WBO #9/WBA #12 heavyweight Denis Boytsov (22-0, 18 KOs) against the rugged warrior Vinny Maddalone (31-4, 22 KOs). All were on hand at Monday's (10th November) press conference at "Uerige," a local Düsseldorf brewery. "It can't go wrong," said the 26-year-old Dimitrenko. "I've had the best preparation and am psychologically at my best . I have the best trainer and God is behind me. Everything is good. I will win!" 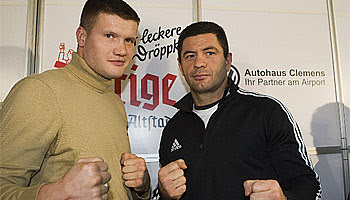 Dimitrenko's trainer Fritz Sdunek added, "We all know each other very well and [from the fighters' perspective] this is one of the most unpopular and unpleasant intra-stall bouts. Everyones' nerves will be on edge even more than usual. Sascha is in the best physical and psychological condition. Whoever has the stronger psyche wins. One punch can decide it! " His challenger Luan Krasniqi stated, "I'm grateful that I got the chance to box against the #1 world ranked fighter. I also see it as Fritz Sdunek does, the better nerves will decide it. I've already had difficult times behind me and people have often said it was my 'last chance' but I'm still here. A person learns more from losses than from victories. Physically I feel like a 28-year-old. Vitali Klitschko is the same age as me and after a four year break he became world champion again. That is also my goal. I am up for this fight against the #1 as seldom before and want to win, no matter how!" Krasniqi's "new trainer" Valentin Silaghi commented, "I've trained Luan now for more than a year. This fight was already set once. I admire my longtime friend, trainer Fritz Sdunek and have high respect for his work and his successes. For this fight, even though we already know them well, we've studied the DVDs and prepared very well for this fight. I hope that we have the better nerves!" Boystov, meanwhile, was supremely confident that he would get by blood and guts warriors Maddalone. "I will give 110%," stated the unbeaten heavyweight. "My opponent has the greater experience, but if he is good, but I will be better." Boystov's trainer Fritz Sdunek added, "Vinny Maddalone can punch, has a big fighter's heart and the experience of fighting against Holyfield and Minto speaking for him. For Denis, however, his mental strength and his clout will be decisive. He is a "small Tyson!" Maddalone was delighted to be making his first appearance in Europe. "I'm having a great time in Dusseldorf. There will be a good show here and the people will get their money's worth. Against Holyfield, I only lost because there was a bloody headbutt in round two. I've been a professional for ten years now and my experience is my strength." In other notable bouts, in his first fight after suffering his only career defeat against WBA champion Mikkel Kessler, WBA #6 super middleweight Dimitri Sartison (22-1, 14 KOs) returns against Edison Francisco Guedes (11-7-1, 5 KOs), and WBA #3 super middleweight Gusmyl Perdomo (15-2, 9 KOs) meets Laurent Goury (14-17, 2 KOs). dhe Preferohet te jete me Video si Filma Humor etj. 3. Company: Nese jeni duke punuar ne ndonje kompani, vendojeni emrin e kompanis, nese jo pershkruaj ndonje kompani qe e keni aty afer. 7. Screen Name: For Faster Customer Service: Vendoni nje Nickname, ne te cilin do ta mbani mend lehte. 19. Website Description: 80 character minimum. The more details you provide, the better your chances are of being approved: Mundoni qe te vendosni nje pershkrim professional per webfaqen tuaj, dhe per sherbimet qe ju ofroni. 20. Please Describe how you will get your users to complete our surveys: Pershkruani se si do ti beni vizitoret qe te plotesojne nje reklame. 21. Where did you hear about us? : Mund te shkruash nga nje shok ose nga Youtube. 23. Dhe Klikoni Send Application. nese sbesoni tek une regjistrohu nje here dhe ke shqiptar ne chat qe brenda dite fitojn mbi $100-$500 Dollar edhe kjo eshte epr nje dite. Edhe vete skam besuar deri sa e kam Provuar vete eshte nje nder Kompaniat me e madhe sa i perket Pageses Google adsense eshte (0) per kete Provo edhe bindo brenda dite shef ndryshimin me nje pune te Vogel. Shume shqiptar tashme jane duke fituar e pse jo edhe ti Shresoje nga zemra qe ju kam ndihmuar sado pak,Kalofshi mire te gjithe.